Here is a food most of us save for Thanksgiving and marshmallows, but it turns out to be easy to digest and a great source of nutrients for baby. It is also a nutritious alternative to potatoes if you are bored with them. Of course, you need to have the time to bake or boil them. Baking them means that you can just leave them until the timer rings. Always remember to put a timer on when you are cooking with a baby around. It is amazing the things you can forget to do when a little one is grabbing your attention. We also call these yams, but a yam is a different tuber (yellow flesh from Japan). 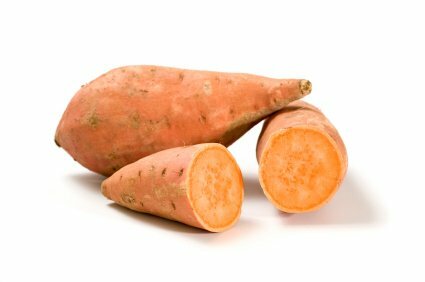 Sweet potatoes are orange-fleshed with a kind of maroon peel and can be found all year round but are best in the fall. They should feel firm with no soft spots. You can make your own really easily by just baking them in the oven. Baking ensures the peel falls right off (no peeling), they get really soft, and you can make some extra for your dinner. VERY IMPORTANT - line baking pan with aluminum foil to make clean up easy (otherwise you will be scrubbing for days). Heat oven to 425 F, poke holes in potato with fork, and bake for 45 minutes to 1 hour. Just peel them, cut into quarters, cover them in water, and boil until soft (about 10 minutes). Cool dry place (not in refrigerator) for 2 weeks. Yes. Potatoes easily absorb pesticides so buy organic when possible.